This is a brand as old as Wright Brothers’ first successful airplane flight. Harley-Davidson. The 115-year-old heavyweight motorcycle brand. In China, it is turning 13 this year. Since establishing its Shanghai office in 2005, Harley-Davidson’s growth in China has been hindered by discouraging motorcycle laws and higher price tags, according to a 2014 Forbes article. The picture is changing now. First of all, urban motorcycle owners are primarily enjoying the roaring two-wheel toys in the countryside instead of in restricted cities. Riders are also sharing tips to avoid strictly enforced routes or traffic time even in cities. Secondly, the price has also become more affordable as Chinese consumers are getting richer fast. According to a McKinsey article, the Chinese per-household disposable income of urban consumers will double between 2010 and 2020, from about $4,000 to about $8,000. In this context, the number of Harley-Davidson dealerships in China has tripled in the last 6 years, up from 11 in 2012 to 33 today. 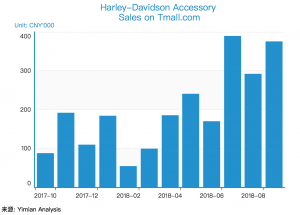 In an effort to gauge Chinese online interest in this American brand, Yimian team charted the accessory sales by Harley-Davidson Official Store on tmall.com in the last 12 months. Comparing to last Oct, the sales almost quadrupled, showing strong momentum of interest in Harley-branded hats, jackets, belts, and gloves. 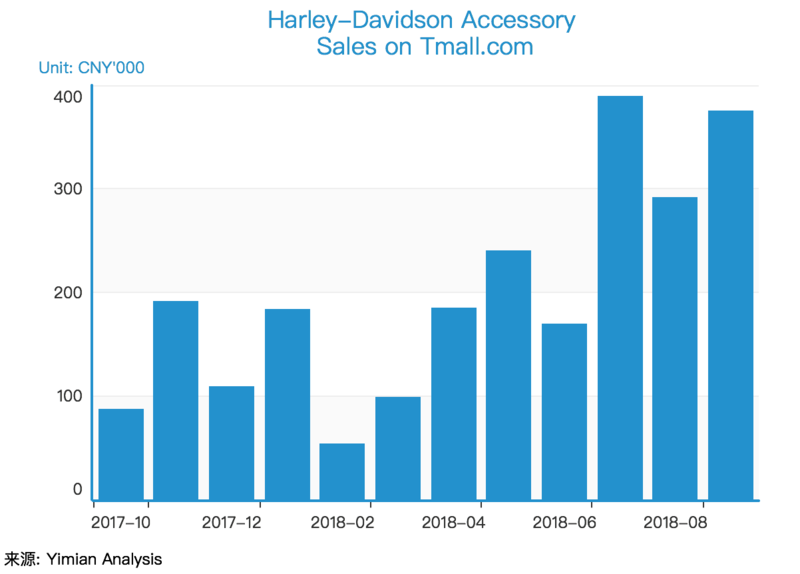 Although the total monthly sales of the Official Store is shy of CNY 400,000 (the price of one mid-spec Street Glide motorcycle), it represents only less than 10% of all-store online sales of any products with the word “Harley” in its title. The dealership growth shows Harley’s commitment and confidence in China. The online accessory sales momentum is one indicator of the increasing public interest. However, Harley-Davidson China is entering its adolescence amid the US-China trade war, which adds challenges and uncertainties. Effective Aug 23, 2018, China imposed an additional 25% of tariff on a list of products from the US (see Announcements No. 5 and No.7  of the Customs Tariff Commission of the State Council). Motorcycles were included, such as Harley-Davidson Street 750 under the category 8711.40.00. A phone call to Harley’s Beijing Dongrun Dealership on Oct 25, 2018, confirmed that all the prices announced in Jan, along with related incentives, were still intact. No additional burden to the dealers… yet. It means that either the dealers are still selling inventory imported before Aug 23, or Harley is shouldering the additional tariff. 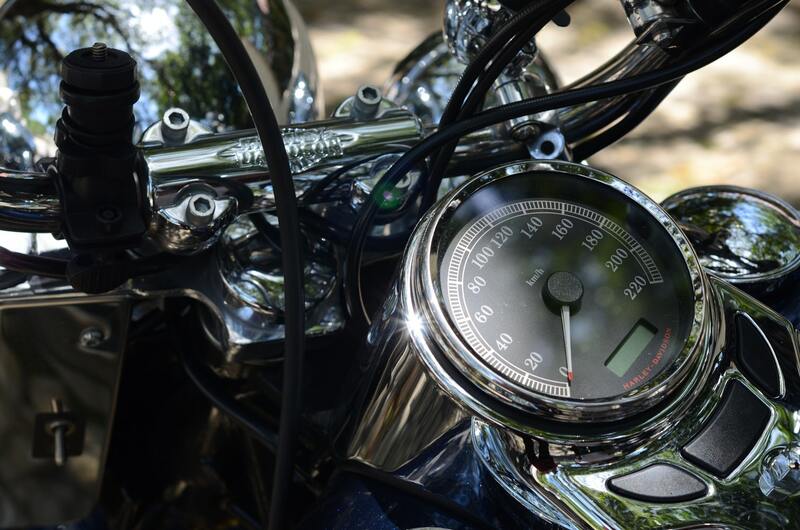 Either way, it’s uncertain how much longer Harley can sustain the current price. According to the company’s annual report, only 1 in 8 Harley motorcycles was sold in Asia-Pacific in 2016 and 2017. In addition, the number of dealerships in China is roughly 1/8 of its Asia-Pacific total (276). Therefore, even if the China business grows as fast as a teenager, it will still be a while before it contributes significantly to the brand’s global sales. To learn more about how Yimian helps global brands turn data into insights, please email Rong Zhang.